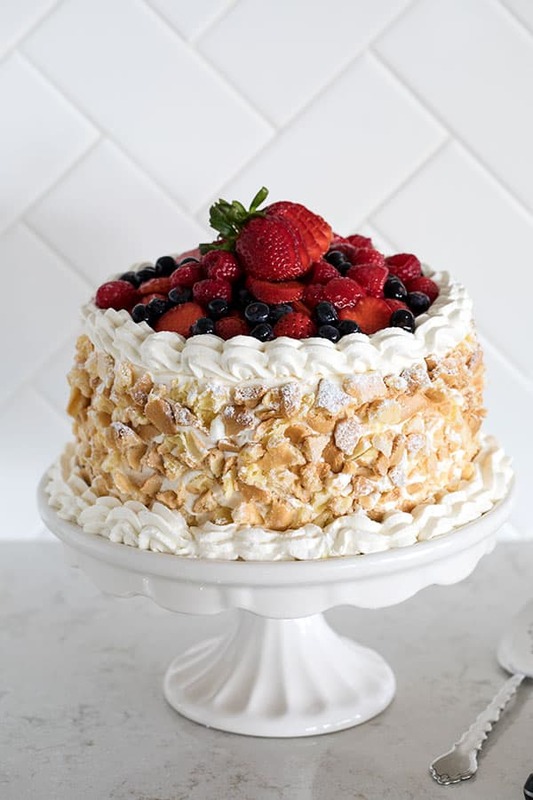 A luscious Triple Berry Choux Cake with four layers of choux sandwiched with triple berry cream, iced with vanilla bean whipped cream, and decorated with choux crumbs, powdered sugar and fresh berries. A special dessert for any occasion. I recently joined a monthly baking group, Baking on the 15th. The first baking assignment was Strawberry Choux Cake. Kelly Wright started the group and also hosted the challenge for the month. Kelly found the Strawberry Choux Cake recipe in The Professional Pastry Chef by Bo Friberg. In addition to strawberries, I decided to use blueberries and raspberries as well and make it a Triple Berry Choux Cake. Adding blueberries to a berry sauce makes it such a pretty dark red color. I also decided instead of a a two layer cake, I’d make a four layer cake so it would be tall and beautiful. Pate a choux sounds fancy and difficult to make, but it’s actually pretty easy. I use my stand mixer to make adding the eggs super easy. A hand mixer works well too. Once you’ve beaten the eggs into the dough, you spread the choux on two baking sheets lined with Silpats or parchment paper. If you’re using parchment paper, you can put a dab of choux paste in each corner to “glue” the parchment down. If you have one, use an offset spatula to spread the dough. You want to spread it so it’s about 1 inch away from the edges so it has room to puff and grow. I used a 7 inch round cake pan as a guide to cut each baking sheet of choux into 2 7-inch circles – for a total of 4 circles. If you don’t have a 7 inch cake pan, just cut out a 7-inch circle and use that as your guide. You’ll use the trimmings to decorate the sides of the cake. Layering the cake is easy. You just put one choux round on the bottom, top it with one third of the cream, and repeat the layers ending with a choux round on top. Decorating the cake is also easy. You tear the excess choux into pieces and bake it just a little longer so it’s crisper. 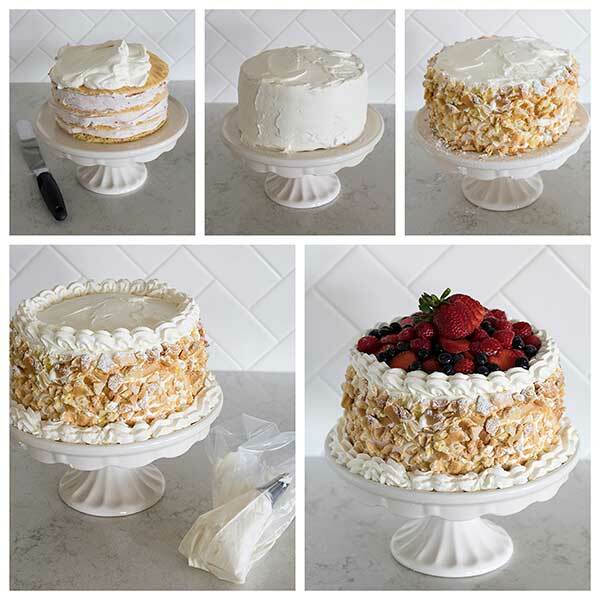 Once it’s cool and the cake is ready to decorate, sprinkle the choux crumbs with powdered sugar and use your hands to press it into the whipped cream icing on the cake. 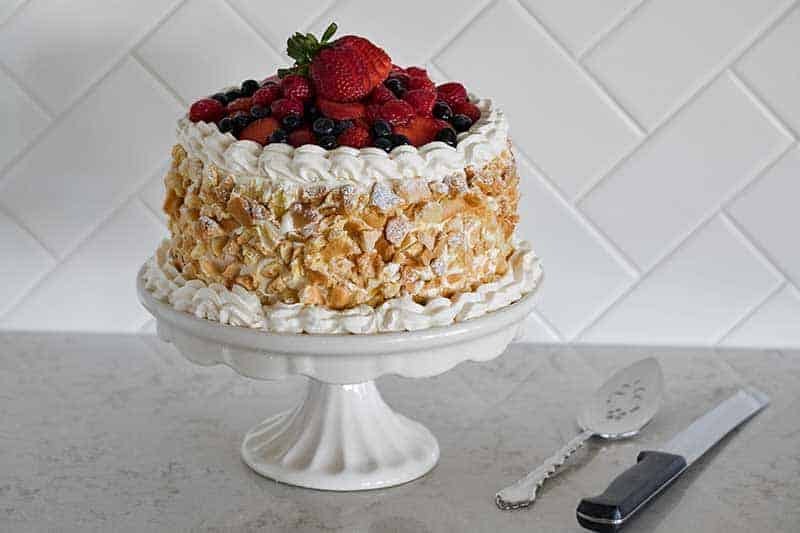 If you want, you can pipe a decorative edge with a little of the reserved whipped cream and then pile fresh berries on top. I added about a tablespoon of the triple berry sauce I made for serving the berries to give them a little extra shine. You’ll want to make sure that you allow plenty of time for the cake to chill so the Triple Berry Cream filling has time to set up. Then the cake will slice easily. I served each slice with a spoonful of triple berry sauce. I made a double batch so I’d have plenty of sauce to serve with each slice of cake. This cake has a lot of steps, but it really isn’t difficult to make. I made this cake for a family birthday party and everyone loved it. My cookbook, Simply Sweet Dream Puffs, is all about making fun desserts using pate a choux. If you haven’t made pate a choux or cream puffs before, I’ve created a How to Make Cream Puffs Video to show you how easy they are to make. I’ve also created templates to help you pipe them just the right size. And an eclair video to show you how to pipe, filled and decorate eclairs. 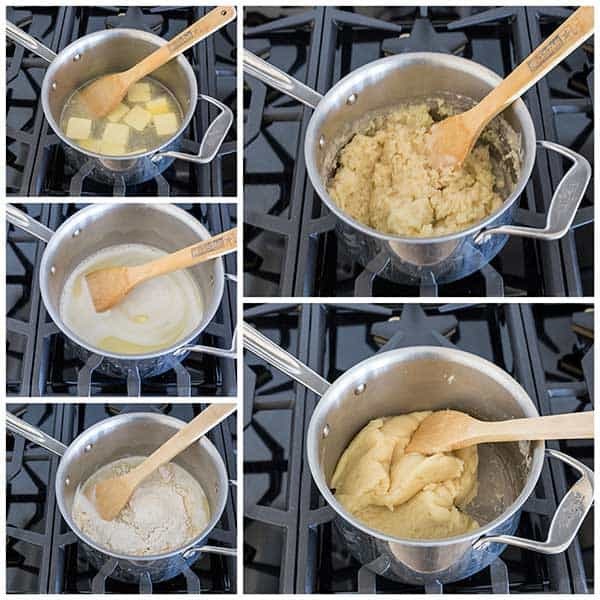 If you’ve never made pate a choux before, this is a fun recipe to start with because you don’t have to worry about shaping the dough and the end result is a showstopper. 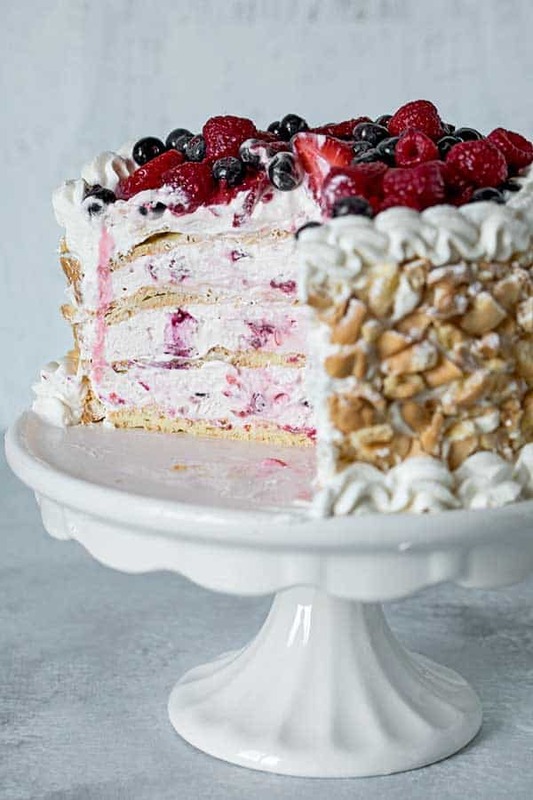 A luscious Triple Berry Choux Cake with four layers of choux sandwiched with triple berry cream, iced with vanilla bean whipped cream, and decorated with choux crumbs, powdered sugar and fresh berries. Bake the Pate a Choux. Prepare the Triple Berry Cream Filling. Place one 7-inch round of choux on a cake stand or serving platter. Top with 1/3 of the triple berry cream filling. Add a second choux round and press lightly into cream; add 1/3 of the filling, a third choux round then the remaining berry filling. Finish with the fourth choux round on top. Refrigerate for 2 hours. Prepare the Chantilly Cream. 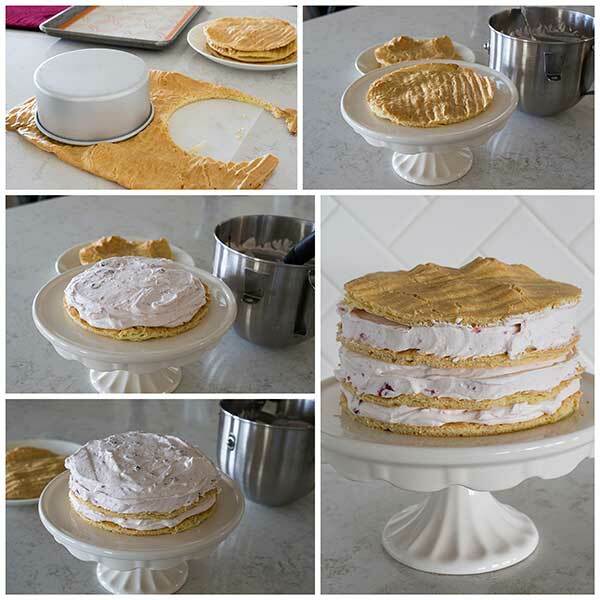 Reserve 1/3 of the whipped cream to pipe a decorative edge around the top and bottom of the cake. Ice the sides and top of the cake with the remaining 2/3 of the whipped Chantilly Cream. Use your hands to gently press the cooled choux crumbs onto the sides of the cake. Pipe a decorative edge of whipped cream around the top and bottom of the cake. Pile fresh berries on top of the cake. Chill until ready to serve. Best if eaten as soon as possible after it's decorated. Stem and cut strawberries into bite size pieces (if using). In a medium saucepan, add the berries, sugar and lime juice. Bring to a boil over medium high heat stirring constantly. Remove from heat and pour into a bowl. Chill completely before using. Preheat oven to 375°. Line rimmed baking sheets with a Silpat or parchment paper. Measure flour and set aside. Bring butter, sugar, salt, and 3/4 cup water to a boil in a large saucepan over medium-high heat, stirring occasionally. Immediately remove from heat, and quickly stir in flour mixture all at once. Return to heat and stir with a wooden spoon for 1 to 2 minutes, or until dough is smooth and forms a ball. 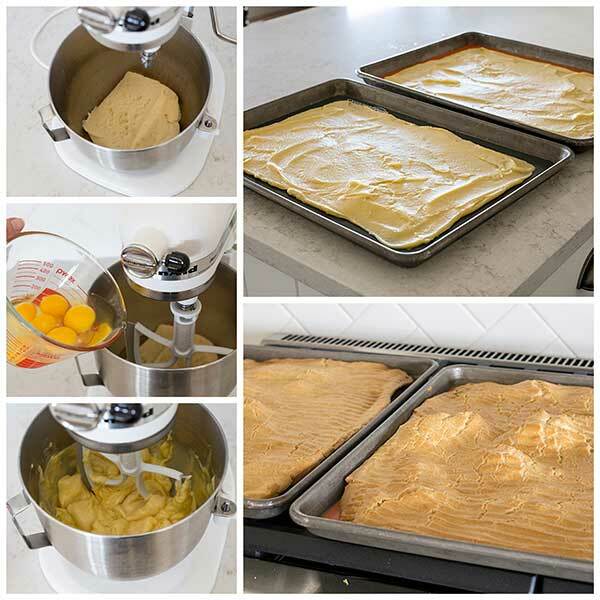 Transfer dough to the bowl of an electric mixer, and let cool 10 minutes. Add eggs, 1 at a time, beating until mixture is smooth and glossy. Divide the mixture evenly between the prepared sheets. With an offset spatula, spread the mixture evenly over the Silpat until it's about 1 inch from the borders of the pan. Bake about 40 minutes until the pate a choux is firm to the touch in the center. Remove the choux from the Silpat to a large cutting board. Cut 2 7-inch rounds from each baking sheet of choux for a total of 4 7-inch rounds. Reserve choux scraps to decorate cake. Add water to a small bowl, sprinkle gelatin over the water and allow it to sit until water absorbs the gelatin. Microwave for about 30 seconds until mixture comes to a boil. Stir until gelatin is completely dissolved. Heat 1/2 cup heavy cream in the microwave until it's lukewarm. Add dissolved gelatin. Add remaining 2 1/2 cups heavy cream to a large mixing bowl. Begin mixing on high speed and slowly add the gelatin mixture. Continue mixing until soft peaks form. Fold in the chilled berry sauce. In a large mixing bowl, beat the cream at high speed until it starts to thicken. Add powdered sugar and vanilla bean paste. Tear the reserved choux scraps into 1/2 inch pieces. Place on baking sheet and bake until pieces are completely dry about 15 minutes. Dust with powdered sugar before applying to the sides of the cake. Note: I doubled the Triple Berry Sauce and used half in the Triple Berry Cream Filling and the other half I served with the cake so my guests could drizzle more sauce over each slice of cake if they desired. Absolutely gorgeous! I like the addition of the others berries. I want to revisit this with blueberries and/or blackberries. Your cake looks absolutely amazing. I just can’t say that enough! This was fun but I’ll tell you this…next time I make choux I’m heading here for a recipe…boy did that original recipe make a lot. Thanks too for the great photos…I linked to you since I didn’t do any process shots at all. I made choux with a group once but had never tried it at home; it was easier than I had always imagined but it still does require some attention to detail. Love your cake, it’s a real beauty! Such a beautiful cake–perfect choux, perfect layers! I love the 3- berry combination with sauce as well. How cool to have a choux expert on our first challenge! Now to watch your video so I can give choux another go! Thanks so much for joining the group, Barbara! Thanks for picking such a fun challenge Kelly! That’s one take-your-breath-away gorgeous cake Barbara! What a beauty! Well done, dear.